West Coast Paracord's triple-twisted cotton rope, also known as laid rope or cotton cord, is perfect for any use or ideas you may have. Our twisted cotton rope kits come in either 1/4 inch or 1/2-inch diameters and comes in either 40 or 100-foot length. 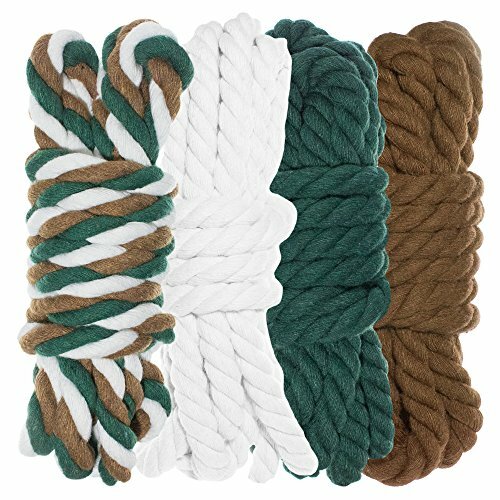 Made from 100% cotton, the softest of natural fibers, this cotton rope doesn't cause discomfort making it perfect for rope rugs, rope baskets or bins, hammocks, crafting, bag handles, and so much more. This cotton rope isn't just for arts and crafts. Whether you're crafting a hammock, a tire swing, showing boy scout troops how to practice tying knots or for an emergency tent line, it's great to have on hand. Add your personal touch to any project you're making - whether for your personal use or to sell or give as a gift. Many of our customers recommend this rope for macramé, wedding décor and ceremonies, DIY house décor, crafting jewelry and more. The possibilities are endless. - 10 feet of 4 complementary colors in either 1/4" or 1/2" diameters. -25 feet of 4 complementary colors in either 1/4" or 1/2" diameters. NATURAL COTTON ROPE EASY TO TIE IN KNOTS, SPLICE AND IS SOFT TO THE TOUGH: Our cotton rope is easy to knot and splice which makes it great for beginners and advanced users. Cotton is the softest of all the fibers making it ideal for when rope abrasion is a significant factor. SOLID COLOR CONSTRUCTION: The outside color is the exact same as the core. Our natural rope has a solid colored core that means it truly is 100% cotton - to the core! CREATE PROJECTS WITH THIS EASY-TO-WORK-WITH COTTON ROPE: Our high-quality twisted cotton rope can be used for cording, perfect for stringing jewelry and accessories. Excellent for handmade projects and macramé. Create rope baskets or bowls, as tent-line rope, hammock rope, halter or lead rope, harness rope, crab trap rope, and awning rope. Our wide variety of colors are suitable for number of decorative uses: wedding ceremonies, rustic wedding décor, events, interior design.